Pirates interim manager Pete Mackanin didn't see his pitcher pitching well, he told The Beaver County Times. The end result was Mackanin pulling the starter in the third inning. It was September 2005 and Mackanin was spending just his second game as a major league manager. "Sometimes, you've got to make a move based on what you think is going to happen," Mackanin told The Times, "instead of waiting until the damage is done then saying I should have taken him out." It was Mackanin's third game as a major league manager, but hardly his first as a skipper. Mackanin brought with him no fewer than 13 seasons as a manager in the minors, and, to that point, seven seasons as a big-league coach. Mackanin's stint as manager with the Pirates only lasted as long as the 2005 season. He has gone on to be an interim manager with the Reds, and a bench coach with the Phillies from 2009 through 2011 and later third base coach. It's a resume that has Mackanin being looked at for a big league managerial job without the interim tag. Mackanin's coaching and managerial career began in 1985, the season after his playing career ended. Drafted in 1969, Mackanin played parts of nine seasons in the majors, with the Rangers, Expos, Phillies and Twins. His last big league game came in 1981. For 1985, Mackanin joined the system of the team he last played for, the Cubs. 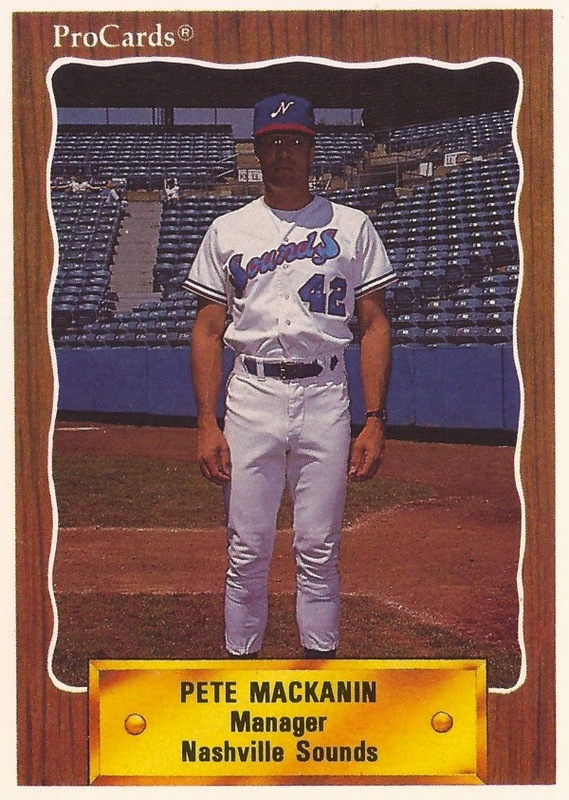 Mackanin went from AAA Iowa as a third baseman in 1984 to single-A Peoria in 1985 as manager. Mackanin stayed with the Cubs through 1989, spending his final two seasons as the manager back at Iowa. For 1990, he joined the Reds organization, as skipper of AAA Nashville. Mackanin's first year at Nashville saw his Sounds make the playoffs after a wild play-in game. It was an 18-inning marathon, one where Nashville used 20 players and missed several scoring chances, The Associated Press wrote. "It was exciting. It was terrible. It was disgusting," Mackanin told The AP after the win. "Twenty-two years I've been in this game, I've never seen anything like it." After three seasons there, Mackanin joined the Orioles as manager at single-A Frederick in 1993, then AA Bowie in 1994. He arrived back with the Expos, the team he had the most success with as a player, in 1995, serving as manager at AAA Ottawa. In 1996, he managed in the AAA All-Star game. By 1997, he was back in Montreal, as third base coach. He stayed in that position for four seasons. He joined the Pirates system in 2001, as manager at single-A Hickory. He moved to Lynchburg in 2003, he then arrived in Pittsburgh as bench coach in 2003. After Lloyd McClendon was fired in September 2005, Mackanin became the Pittsburgh interim manager. "It's not easy when you're not winning," Mackanin told The AP after McClendon's firing. "I don't have a magic bullet, but I'm going to do the best I can to get something positive out of the last three weeks." The Pirates, though, went 12-14 under Mackanin and he was not brought back. Two seasons later, Mackanin was in the same position, elevated to interim manager of the Reds for 80 games in 2007. The Reds went 41-39 under Mackanin. But, again, Mackanin wasn't invited back. "I'm very disappointed, but I have to move on," Mackanin told MLB.com after learning he wouldn't return. "I hope there's interest in me somewhere else. I'll be calling everybody. I need a job." Mackanin got a job, as a scout for the Yankees. For 2009, Mackanin became bench coach with the Phillies, a job he has held through 2011. And, Mackanin has getting more interest, with a possible return as a big league manager. He was the first candidate interviewed in fall 2011 for the open Red Sox post. He was also mentioned for the Cubs' open head job. "He's got a really broad set of experiences that appeals to us," Red Sox GM Ben Cherington told ESPNBoston.com after Mackanin's interview. "He can see the game from different perspectives, which I think is a benefit. He's got, as you saw, a good way about him, a good sense of humor, mature, and a good reputation from every clubhouse that he has been a part of." Mackanin, though, has continued coaching. He's serving as Phillies third base coach for 2015.